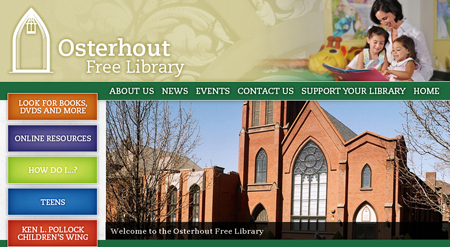 The Osterhout Free Library has a brand new web site design. We have truly enjoyed working with such a positive organization for the community. The Osterhout Free Library provides materials and services to all residents of Luzerne County enabling them to obtain information, free of charge, for their personal, educational, recreational and professional needs. Their mission is to continue to broaden these services and to stimulate their use. The opportunity to enhance the mission statement for this library has certainly been rewarding. The staff of the library really took a major role with this project. We all worked together in order to create the best possible design and navigation which ultimately serves the community. It is projects like the Osterhout Free Library that bring fulfillment to all of us here at BlackOut Design.